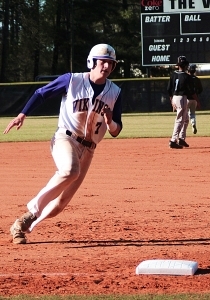 The Lakeside Vikings rebounded from a rough third inning to rally for a 9-6 home victory over the Stephenson Jaguars in the cross-county matchup on Tuesday. The Jaguars (13-9-1) fell behind 5-0 after two innings, but rallied for six runs in the top of the third inning behind a hard hit single up the middle for two RBI from Ryan Ingram. The Vikings had three errors in the inning, including one that allowed two runs to score with two out. Stephenson starting pitcher Vincent Latimer settled down after giving up four runs in the first inning to strike out three consecutive Vikings in the second to hold the deficit at 5-0. He would only face three batters in the third inning, including his fourth strikeout of the game. Lakeside (10-11) starter Jack Tansill left the game after getting out of the big third inning by the Jaguars and reliever Daniel Harrison came in to set the Jaguars down in order in the top of the fourth. Levi Cloud singled to open the bottom of the fourth for the Vikings, stole second and moved to third on a wild pitch to put the tying run 90 feet from home. Charlie Ludwick followed with his second walk of the game and his second stolen base of the game to put the go-ahead run at second with nobody out. Gus Young was hit by a pitch to load the bases with one out and a balk called on Latimer tied the game as Cloud scored the tying run and put Ludwick at third and Young at second with one out. Matthew Holt grounded out to short to score Ludwick with what would be the winning run to put the Vikings ahead 7-6. Latimer would pick up his fifth strikeout of the game to get out of the inning without any further damage. Stephenson got a runner on via a walk but could not muster any runs against Harrison in the fifth. Lakeside added two insurance runs in the fifth as Jeremy Clark and Nate Yeager had back-to-back singles to open the inning. The pair would both eventually score on wild pitches before Marc Lewis relieved Latimer to shut the door. Harrison closed out the game with a strikeout and ground out after allowing a one-out hit to Devon Williams. The Vikings had got out to a 4-0 lead in the bottom of the first inning after Tansill got out of a one out jam by coaxing a double-play to end a Jaguar threat in the top of the first. Carlos Hernandez had an RBI single and Donovan Chisolm was hit by a pitch with the bases loaded to drive in another run. A wild pitch and a fielder’s choice grounder to third by Clark accounted for the other two runs. The lead was 5-0 after Ludwick singles, stole second and scored on a wild pitch in the second inning. Levi Cloud was 2-3 at the plate, stole two bases and scored a run to lead the Vikings while Ludwick was 1-2, stole two bases and scored three runs. 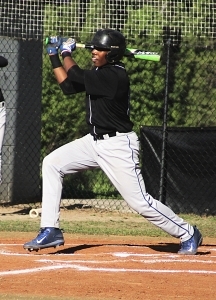 Devon Williams was 2-3 (two bunt singles), stole a pair of bases and scored a run to lead the Jaguars. Ingram was 1-2 with two RBI. Daniel Harrison picked up the win on the mound for Lakeside with three innings in relief of Jack Tansill. Harrison struck out three, walked one and allowed just one hit. Vincent Latimer took the loss for Stephenson.